As revealed in the deep-dive developer blog and subsequent trailer, we’ll be introduced to a new cast of characters in NBA 2K17’s MyCAREER mode. Of course, the presence of fictional characters in basketball video games is nothing new, and goes back a long way before NBA 2K began taking a story-driven approach to MyCAREER. While we obviously remember and are familiar with the real players featured in basketball video games, new and old, those fictional players and other characters we encounter also have a tendency to stick in our minds. For this week’s Friday Five, I’m compiling a list of some of the most memorable characters we’ve seen in basketball video games. Please note that I don’t necessarily mean memorable in a positive sense; just that we do remember them. 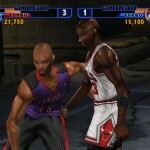 Please also note that I’m excluding secret players in NBA Jam who are actors, politicians, or developers, as well as NBA mascots (who are obviously characters, but not ones created specifically for basketball video games). 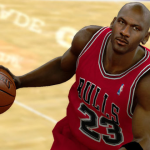 These are five fictional basketball video game characters that are all memorable for one reason or another. As it stands, basketball gamers don’t have a lot of choice year-to-year. 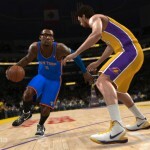 You can either buy NBA Live, NBA 2K, or both, or stick with an older release. Alternatively, you could not play basketball video games at all, but if that’s the case, you’re not exactly relevant to this discussion; no offense. While I wouldn’t be against another developer throwing their hat into the ring with a sim-oriented NBA game, I’m not sure that we necessarily need that to happen. I think that we basketball gamers will be alright as long as NBA 2K continues to do its thing, and NBA Live makes some big strides this year. Of course, there’s always room in the market for other types of basketball video games. This includes full-blown arcade basketball titles, or perhaps sim-oriented games that focus on different leagues. Cheaper digital releases that focus on mini-games and the like. Resurrections of popular old properties, as controversial as that practice can sometimes be. As you can probably guess, I have a few possibilities in mind; without any further ado, here are five basketball video games that I’d like to see developed. While we generally deal with sim oriented basketball video games in our community, several of us are also fans of the arcade style games. As I’ve said several times before, I’m an NBA Jam fan from way back in the day, and I still like the idea of having arcade basketball games as a change of pace from five-on-five simulation fare. Sometimes, you just feel like a quick game with somersault dunks from the rafters. 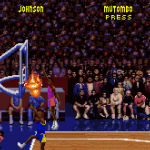 This week, I’m counting down my Top 5 arcade basketball games. It’s a slightly easier list to compile than the Top 5 simulation basketball games, as arcade basketball games tend not to have annual releases, thus there are fewer of them and it’s easier to pick out the best five from the cream of the crop. I might try to tackle the Top 5 sim titles in a future Five, but for now, here are my picks for the Top 5 arcade basketball games. Since I’ve previously looked at some of the most unstoppable moves in basketball video games, this week I thought I’d take a look at some of the best power-ups that we’ve seen in virtual hoops. Generally speaking, power-ups are probably not a concept that most people associate with basketball video games. However, they do have a presence in the genre, mostly in arcade-oriented titles but also in more subdued forms in certain sim releases. As I’ve mentioned before, while I want to get a sim experience out of the NBA Live and NBA 2K series, I also enjoy arcade style basketball games for a change of pace. Having some fun and crazy power-ups certainly adds to the arcade experience, and special abilities in general make games more interesting and varied. 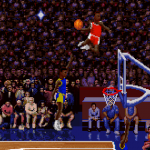 So, without any further ado, here are my picks for the five best power-ups in basketball video games. Thanks to Mazzochi for getting this started again, but I spent some time today creating profiles for Hex on Steroids, which effectively acts as a roster editor for NBA Street Vol. 2. Both the Gamecube and PlayStation 2 versions of the players and teams database files are supported, so we can edit the files and play them on PC emulators such as Dolphin and PCSX2. There is hope that this may eventually turn into a fan-made HD remake of this classic game, but there is still plenty of planning, organizing and texture making to do before that. In the meantime, check out this Forum thread for more information. If you are interested in helping out, or editing the files yourself, you can get the profiles from the NLSC Download Database and watch the tutorial video below on how to use them. EA Canada is apparently holding playtesting sessions on April 11th and 12th for a “New NBA Concept” and are inviting anyone in the Vancouver area to fill out a survey if they are interested in getting involved. There’s no further information on the concept at this time and anyone who participates will certainly be under a non-disclosure agreement, but if you live in the area and are interested in doing some playtesting and getting a glimpse behind the scenes, I’d encourage you to fill out the survey. It will be interesting to see what this new concept turns out to be. It’s unlikely to be NBA Live, which is currently being developed at EA Tiburon, but could be something related to NBA Jam or NBA Street if not a new game entirely. Feel free to speculate in the comments below, as well as in this thread in the NLSC Forum.